A unique selling proposition (USP) is the reason people do business with you and not someone else — a winning difference that sets you apart and makes you the only real choice. Traditional marketing advice will have you lock yourself in a cave for weeks listing all of the features of your business, translating them into benefits, then somehow finding that one compelling point that will differentiate you from everyone else you could possibly compete with. These days, your winning difference depends more on who you’re selling to more than the features of what you’re selling. You need to stake out a favorable position in the minds of those you’re trying to attract, even while turning the wrong people away. If you have a firm grasp on what your ideal customer looks like, then you can do some simple exercises to discover your own winning difference. We’re going to show you how to that today. Unless you’re launching FedEx, you don’t need a USP as robust as FedEx’s. Try each of these five-minute exercises and see if they don’t shake loose a USP that will work for your site. Remember that content consumers don’t go to just one blog, subscribe to just one site, or buy just one product. They want anything and everything about the topic they love. That means your USP doesn’t have to beat everyone else out. It simply has to appeal to your target audience. To create a crossroads USP, take two seemingly unrelated ideas and bring them together. The hit movie Speed was famously pitched as “Die Hard on a bus.” Clueless is Jane Austen’s Emma set in 1995 Beverly Hills. You can create a crossroads USP by taking something well-known and presenting it to a new audience. Maybe you’ll offer Yoga for Stockbrokers, or Business Blogging for Veterinarians. You’re looking for two roads that are different enough that you create some energy, but not so different that you can’t realistically bring the roads together. “The Complete Guide to Flower Arrangement for NFL Players” probably won’t find an audience. Sometimes you can find an overarching metaphor that will snap everything into place. For example, Duct Tape Marketing offers something you can find in lots of places — marketing advice for small businesses. But the “duct tape” metaphor reveals a lot. It tells you the approach is practical, effective, and not terribly fancy. It probably skews slightly toward men, but not exclusively. It can be interpreted many different ways. And it doesn’t take itself too seriously. No one’s ever going to confuse Duct Tape Marketing with a site called Green Planet Marketing or Mama Bear Marketing. With this approach, you can create your own USP just by using a metaphor to define the market, the approach, and the angle. If all else fails and you can manage to be reasonably interesting, your USP can simply be … you. Seth Godin, Martha Stewart, Tony Robbins, Cal Worthington (and his dog Spot), Erika Napoletano, and Gary Vaynerchuk have all created persona-driven brands. They started with something fairly ordinary (business advice, housekeeping tips) and made it extraordinary through the force of their personality, their passion, and their individual expression. If you’re going to create a persona-driven USP, you’ll need to keep showing up. It’s your job to stand front and center and say something interesting. You’ll provide the voice and flavor for your content. And don’t think you have to have a “shock jock” personality for the persona-driven USP to work for you. Chris Garrett and Darren Rowse are both soft-spoken, helpful gentlemen who created successful businesses by focusing on what they cared most about and how they could help others. 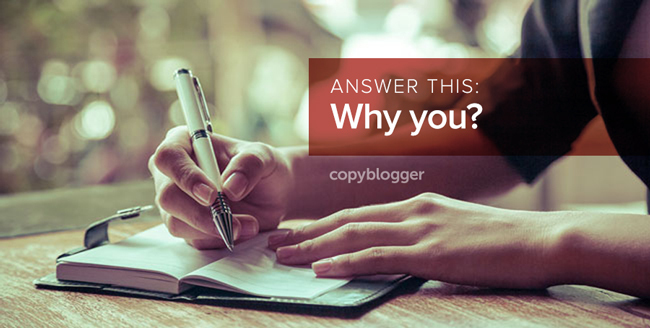 Why should anyone read your content? Why should anyone buy your product or retain your services? What do you have to offer that makes it worth anyone’s time and/or money? It can be a painful question, but it doesn’t have to be one that ties you in knots for weeks on end. Keep it simple, and keep moving forward. The strongest USP on earth won’t help you if you don’t back it up with all the other actions that create a successful business. I agree. We simply need to be clear about the value we provide our clients (readers). Ive been exploring this a bit with my fitness site, and really havent sat down and gave it much thought. Great, specific examples and options for this important, yet seemingly confusing topic. One note – actually I get great response to Duct Tape from women too – and it’s not my dashing good looks that drives that! I once gave away bright pink rolls of duct tape at a workshop for women business owners and they were fighting over it. I think the persona driven USP is more appealing then other 2, You are the main source of motivation and medium of sell , and no one can represent your brand batter then your self. @Sunil – sure that one works well for some, but what if you want to sell the business, then it better be able to be just as appealing without your persona. Very concisely broken down, Sonia. I love that you are able to take a complex subject like branding and USPs and make it so unbelievably simple. Very helpful. The crossroads approach is great for sparking creativity. Myself, I’ve recently started a series called “Lifehacks à la Gilbert and Sullivan” and it’s been fun. But if you’re not careful this approach can take too small a slice of the pie. If you aim at too small a niche, that’s exactly what you’ll hit. The solution might be to have a broader blog topic and do a few interesting crossroads-inspired series. If anybody bothers to read “comments,” please @ reply me if you read this @brucebski plz. Here’s what’s great about this article. I already know I don’t have to read more than the first sentence to know it doesn’t apply to me, right now. This one I save for later, when I have a clue. Right now, I paid a lot of money to know that I am “consciously incompetent,” at this moment in the process of “social marketing.” This person gives great laser type direction, if you are that far in the journey. I’m not, and I’m exploring. I read what applies to me now,and save other things for later. If you are like me, just trying to make your way, come along, and let’s follow this person together. I know the advice they give is going to be great, once I’m that far in the journey. Like I said above…does anybody really read the comments? I guess will shall see. It seems as if you get excited about your blog or companies concepts then people will get excited about you! My thoughts anyway. Great insight and thought-provoking material. Thank you for the reminder to stop and think about what differentiates us from our competitors. What an excellent post Sonia. “If you are your authentic self in your business, you have no competition.” A great quote that says it all, I think I want to make it my new mantra! The crossroads USP is a great creativity tool and can spark off some realy strange combinations. But as Terry says it could create a small niche in an already small niche. As for my site I need to have a proper think about USP as it is still early days for me. Maybe when my blog gets bigger I will come back to crossroads USP. Thanks for raising this subject. Well, don’t be “you” if nobody likes you. Nobody will like your blog either. Absolutely loved the last line of the article. One of the strongest principles of copywriting is “it’s not bragging if you can back it up.” Your USP might be crossroads, metaphor or just you, if you do not back up your USP, there is no point is indulging in a USP-discovering exercise which would eventually be a waste of time. @brucebski I read the comments. Comment sections on blogs are what make them a conversation between readers and the author of the blog, as well as amongst the readers themselves. I don’t comment on this one as often as I’d like, mostly because I usually read it in my RSS reader or an email, but today I decided to read it on the web so here I am. @JohnJantsch I love DTM, too, and my comment above can be applied to your blog as well. I would go nuts if I had a red or bright pink roll of duct tape! I feel in today’s economy having mission or a purpose is another great USP. People want to belong to something bigger than ourselves, it’s just kind of built into our DNA. Great advice. Great site, this is my first visit. Go back and read the whole post if you really haven’t. It’s especially important if you’re just starting out. The USP is one of the first things you have define before starting any kind of project (like writing copy or starting a blog). It’s why people will care about you or what you’re doing. Define a USP before you start running in the wrong direction. One last piece of advice, if I may be so bold. Don’t let anyone tell you that you’re “incompetent.” If you’ve already paid to learn, don’t sit back and wait for the next lesson to sink in, don’t just hang in there until you understand it better. “Fail and Fail quickly.” Then pick yourself up and do it again. That’s the only way to get anywhere on your journey. @William Robbins, that’s a great point. Completely agree. Great post Sonia. I’ve never seen this concept broken into categories like that and you included great examples. I think the main reason most people struggle with this is because they focus on what they think about themsevles and their business rather than what their best potential buyer is looking for. Sonia – great article, as always. Thank you! Thinking about the crossroads USP helps me understand more ways to communicate my own intentions and that answer that “why me” question. Very valuable. William “No man is an island” Robbins – agree! Sonia, you really are a very good writer, and annoyingly thought provoking! Every time I want to skim through my feeds because I have lots to do, there’s a Sonia Simone post – meaning I have to read it twice, digest the contents, decide how it affects me, and post a comment! I guess if I’m honest I’ve been focusing on a persona driven USP, but I hadn’t thought through the long term limitations of that. So thank you for the wake up call, and I’m going to try to skew things a little to reduce my reliance on that one USP. Yeah, I’ve thought about this a bit. I guess in the end I went with the metaphor USP, rather than the persona-driven one. Guys like Tony Robbins have built huge brands on their personas, but the guy can’t walk down the street without being recognized. Some people dream of that, but for others (i.e. “me”) it sounds like a nightmare. Video meliora proboque deteriora sequor? Heh. I use an adaptation of crossroads (i.e. a matrix). One axis is my ‘competitive edge’ over my competition (an ‘internal’ element) and on the other axis an attribute that the customer truly values about my ‘class’ of product (an external element). I map all competing offers and see if I have some ‘white space’ – if not then it aint unique. Good points about the USP. You have given me stuff to ponder. I would make the point that the USP depends on the customer and what is unique about the selling proposition is the customer and consequently it really is unimportant to find the USP because it really does not exist. This is one of the best articles I read on Copyblogger in awhile. I will just add a little caution that the idea for this post came when I was talking with a business coach about how stuck her clients keep getting with the USP. They don’t do anything because they’re agonizing over trying to come up with something that’s absolutely and utterly unique on the surface of the earth, when they could be out there doing stuff and making some money. Thanks for this great article. I was working on a corporate mission statement when the article was emailed to me. You’re a lifesaver. I was trying to over complicate the entire process. The persona-Driven USP was exactly what I was thinking but I thought I was wrong to go in that direction! LOL You saved me tons of time and many brain cells. @John & Brain for that same reason i prefer persona driven USP, even if sell my business to some one else, he will require me and my name for future sell, that what we call Royalty or Goodwill here in India. and trust me mate i can give you numbers of examples where a guy earning more for his name and Goodwill , then what he use to earn selling actual product. @Sunil – aah but here lies a danger. Goodwill is extremely subjective and can be lost in an instant. Many businesses have failed (after sale or being handed down to the next generation) simply because ‘so-and-so’ is no longer part of the business. I was just trying to explain USP for the 1,000th time the other day — and now you’ve gone and done it so elegantly that I can just send people the link! Thanks! Having spent several years building up a blog presence on the “intersection” premise (herding cats who do technical training) my only problem is that I’m finding it almost impossible to move beyond that. So I’m starting an entirely new blog and will have double the writing duties during the changeover. But there should be some good opportunities for cross posting and connections between the two. It has given me a lot to think about. I’m not very confident at selling myself or my sites, something I need to work on. Hey Brian could you pleas fix that typo of your name in my previous reply? @Stacy – DM me with your address and pink duct tape will be on its way to you. Best advice in the entire article. Thanks Sonia. Woot @Wendy, that’s just what I was hoping for! Saving brain cells, always good. Always good to learn more about marketing since it’s not one of my strong areas. Some simple but good points here. “Remember that information consumers don’t go to just one blog, subscribe to just one site, or buy just one product. They want anything and everything about the topic they love. Have just discovered this spot and haven’t finished my 15 minutes yet, but I will as soon as this customer leaves. Totally agree. USP is so important but people often don’t think of something UNIQUE. That is the key. You need to ask yourself, what is the reason why people should do business with me over anyone else, and then ask if anyone else makes the same claim. If they do then ask youself again, why should anyone do business with me over ANYONE else. It can be tricky but one you find it you will find direction and generally produce amazing results! Love this. The “why you” question is, to some degree, what everyone is wondering when you offer them your services, online and off. If you’re not aware of what you have to offer that others don’t, you’re missing out on the opportunity to help your audience and consumers. I am an undergraduate student studying strategic communications, and am constantly hearing the importance of finding a USP for every project. I really enjoyed this entry because it went beyond the basic “find a USP” instruction. It made me think about USPs from different angles. You shouldn’t pick a USP that is simply a difference between you and your competitors, you should focus on one that is different, worthwhile, interesting and memorable! I think it’s important to reiterate that you don’t need to think of a USP as a way to ‘hit one out of the park.’ Your differentiating factor may be as subtle as a friendly tone in your writing that puts your readers at ease. Great post. Found this post via the Authority report. Thanks for reminding of the basics of marketing. Very informational and extremely inspiring. I’ll be linking to this from my blog. USPs have helped many companies succeed. And they can help you too when you’re marketing yourself (when seeking a promotion, finding a new job or just making sure you get the recognition you deserve.) If you don’t have a USP, you’re condemned to a struggle for survival – that way lies hard work and little reward. Thanks. It seems that all 3 ideas work well together, especially creating persona plus another USP. I fall into the Persona-Driven USP. I’m just a guy. I teach English at a small college, and I absolutely love pop culture. Because of the esoteric nature of my education and interests, I have–or at least like to think I have–a unique view on movies, books, TV, and video games. But selling that is hard. People want the get rich quick schemes and bulleted lists of ways they can improve themselves or their work. Most people don’t want to analyze things or think about the meaning behind movies and books and TV or the importance of community in online gaming. Most, but not all. There is a niche for this kind of thing I’ve found out, and because of that, I think there’s a niche for everything. It may take a while to find it, but eventually readership grows as long as you, as a writer, have the patience to nurture it through its development. If you don’t know “you” well enough to sell, then how can you expect to sell anything else? As always, your advice is excellent and thought-provoking. It’s an interesting article in that it tells why you need a USP, but not so much how to find yours. I’m not sure a 5 minute exercise will do. Maybe 10 or 15 at least. The exercises are a good start though and that’s better than not thinking about USP at all. Interesting reading no doubt. IMHO a USP is just fire, it needs finite strategy around it to create smoke, which others see and migrate to – otherwise nobody will feel the warmth of your fire. A USP is essential, but useless without the framework of a strategy to drive it. Unique product combined with innovative with good marketing can increase its value. it can not be done separately. its all about bussines strategy . That quote alone made this entire article worth reading. Finding my winning difference with my Unique Selling Proposition(USP) is a grad idea. This post is extremely informative and now it’s time to practice what I learned from this post. I own a successful online business, but when it comes to USP, I am totally lost. I still don’t have one. I simply can not understand how is my business different from others. Great Post! That’s the truth right there! With so many bloggers out there you really have to find your niche and be the best at it! Narrowing your focus can sometimes drive better quality traffic that trying to hit every target in areas you may not know as much about. My USP is video. Always include it in my sites. People like REAL people.